WOODEN STRUCTURE | The WaterNest 100 spindle-shaped casing is entirely made of laminated wood, an innovative product, produced on an industrial scale using a technological process where natural wood is pressure bonded, reducing the defects typical of solid wood. In addition to the exceptional sustainability, affordability and aesthetic characteristics of the product, there are several advantages such as a high ratio of mechanical resistance to weight. 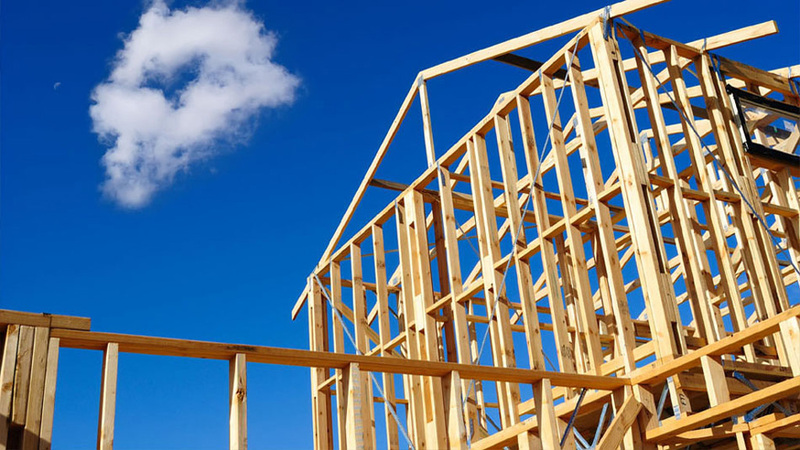 Furthermore, the laminated wood structures have an excellent fire resistance, in fact, combustion occurs slowly due to the good thermal insulation given by the carbon surface layer. SUPERSTRUCTURE | The supporting frame of the WaterNest 100 superstructure is moulded laminated wood, while the cladding and partition walls are curved wood, treated to resist weathering easily. 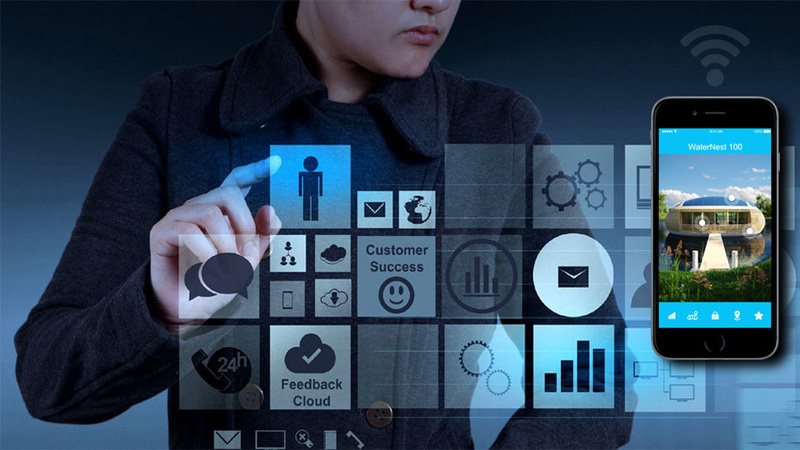 In addition to the exceptional sustainability, affordability and aesthetic characteristics of this material, there are several advantages such as a high ratio between mechanical resistance and weight. ALUMINIUM HULL | The WaterNest 100 hull is made entirely of aluminium, a light alloy, highly resistant to impact, corrosion and 100% recyclable, requiring no maintenance. The tapered shape is achieved by means of aluminium plates which are cut using CNC machines supported with a CAD/CAM system and braced with reinforcing bulkheads. 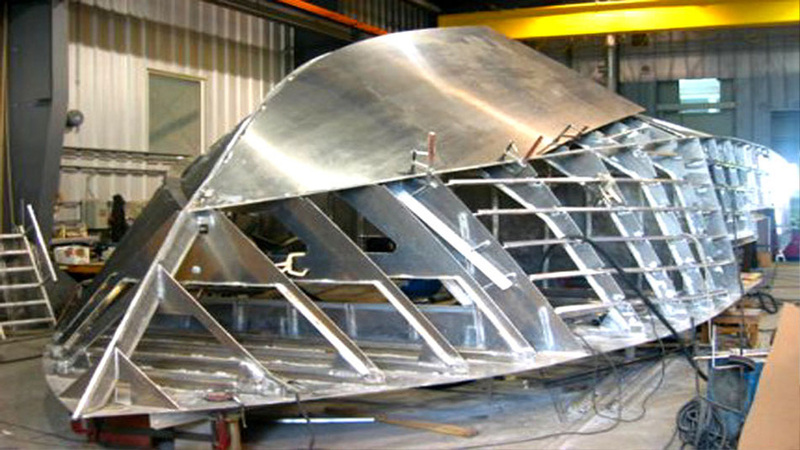 As well as ensuring excellent buoyancy, the hull contains the technical facilities necessary for the residential unit. HULL | The WaterNest 100 hull is made of recycled aluminium with a high quality coating, obtained by coupling and tightening eight separate and perfectly watertight modules. Each module has bulkheads, recesses and slots for all systems essential for the functioning of the residential unit. The choice of a split hull allows storage and transport of WaterNest 100 using common standard trucks or containers with regards to size. PHOTOVOLTAIC PANELS | 60 sqm of amorphous photovoltaic panels capable of generating 4 kWp are installed on the wooden roof of the WaterNest 100 and are used for the internal needs of the residential unit. This type of panels differs from the conventional ones due to the low energy consumption required for their production, making them in fact the most environmentally friendly. 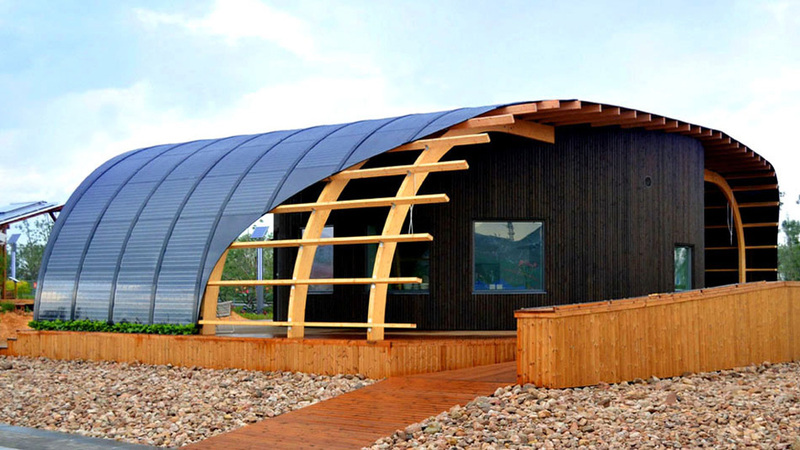 Moreover, from an aesthetic point of view, they can be curved to fit almost any type of roofing. AIR CONDITIONING | The WaterNest 100 integrated air conditioning system allows a filtered micro-ventilation in the residential unit with ceiling and floor air grilles. The retractable system with automatic temperature control ensures very low energy consumption and hardly any maintenance. 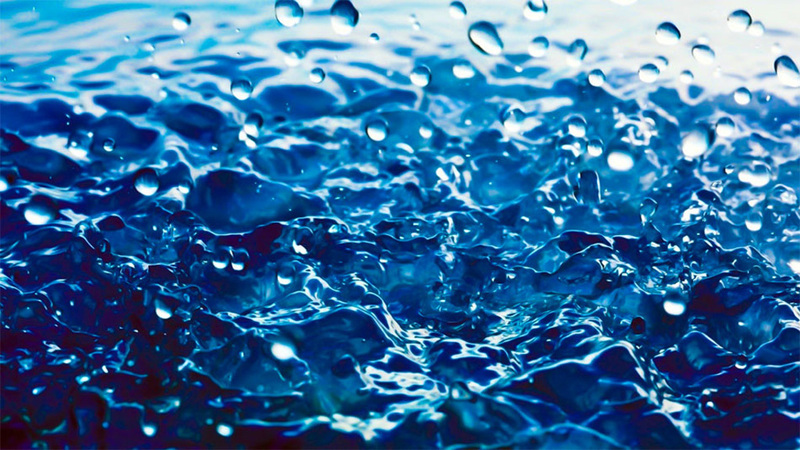 TREATMENT OF WASTEWATER | The WaterNest 100 has a sophisticated integrated system for the purification and filtering of gray and black water (bathroom and kitchen waste, etc.) which can be partly reused for water or completely purified and admittances into lakes, seas and rivers. The only maintenance required approximately every six months is the clearance of simple biological waste products from the internal filter. Naturally, only ecological detergents and soaps can be used on board. For fresh water, the tank capacity is a substantial 1,500 liters. 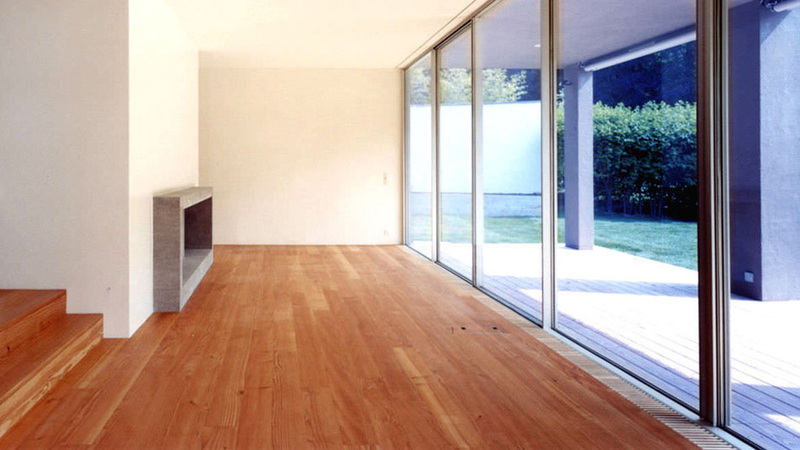 TEAK FLOOR | The flooring and the spacious balconies of the WaterNest 100 which allow you to enjoy fascinating views over the water, are made entirely of high-quality teak to withstand temperature variations, humidity, saltiness and the attacks of atmospheric agents. Like yacht decks, the size of the slats is sufficient to reduce leakages while having the greatest visual impact. ALUMINIUM FRAMES | Thanks to WaterNest 100 large windows you can enjoy fascinating views over the water. 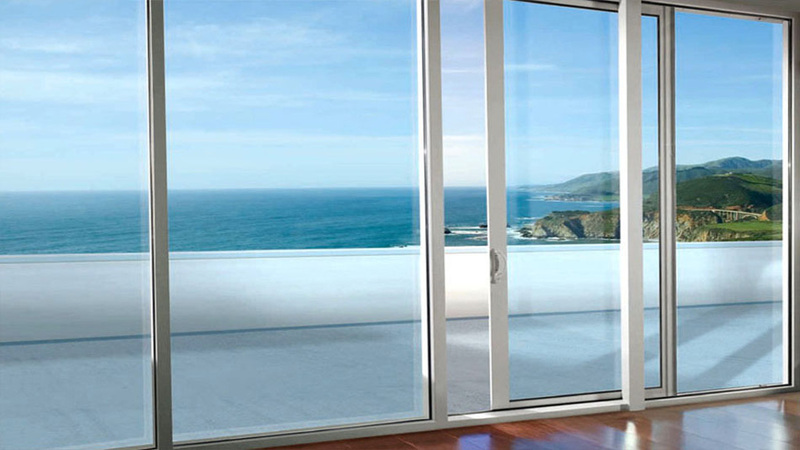 The stylish sliding doors are made of anodized aluminium coated with thermal double glazing so as to obtain good sealing regarding air, water and wind with high thermal and acoustic insulation performances. 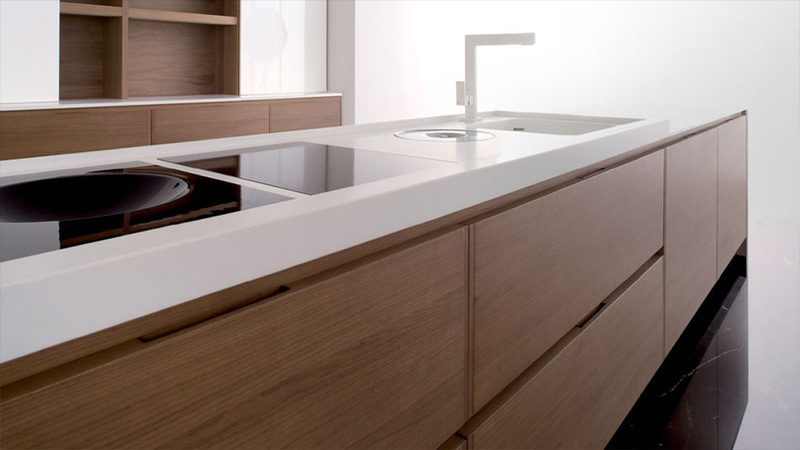 CORIAN KITCHEN | The WaterNest 100 kitchen is modern and welcoming, built using customised thermoformed DuPont™ Corian® solid surface. A recyclable composite material made of 2/3 alumina trihydate and 1/3 acrylic polymer, making it extremely resistant to impact as well as mould and bacteria. 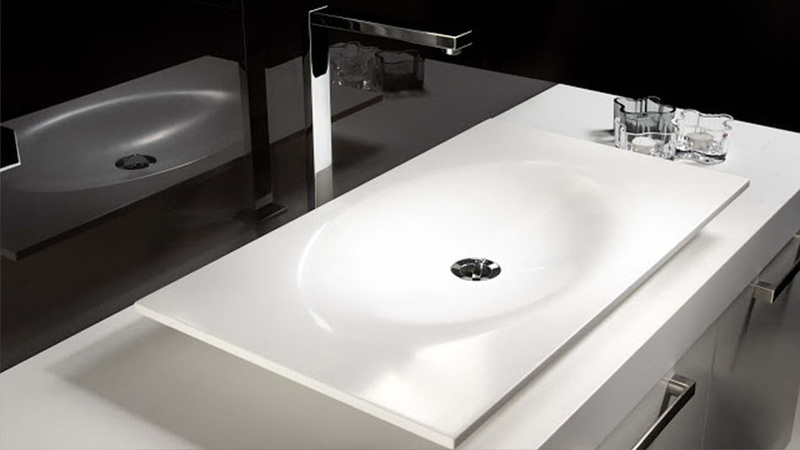 CORIAN BATHROOM | The WaterNest 100 bathroom with its soft and elegant fittings is built using high quality taps, faucets and fixtures with DuPont™ Corian® solid surface thermoformed top. A recyclable composite material made of 2/3 alumina trihydate and 1/3 acrylic polymer, making it extremely resistant to impact as well as mould and bacteria. DOMOTIC SYSTEM | The WaterNest 100 domotic technology is your comfort. You can create the right atmosphere with just one touch: (1) Lighting control – Switch on one, several or all lighting fixtures in your home with a single keypad. (2) MyHome automatically creates lighting paths to facilitate your displacements. (3) Fixtures automation – Draw curtains, roll-up blinds and other powered equipment with no effort. (4) Sound system – Bring your favorite soundtracks, drawing freely from your preferred sound sources. (5) Create an atmosphere – To recreate with a single touch the perfect lighting, air- conditioning, and sound from different preset situations: relax, waking up, leaving home or watching TV. (6) Energy saving – It will allow you to monitor electricity and water cosumption and at the same time managing the temperature of each area of the house. Each function can be customised, controlled or shared on a smart-phone using the appropriate app. 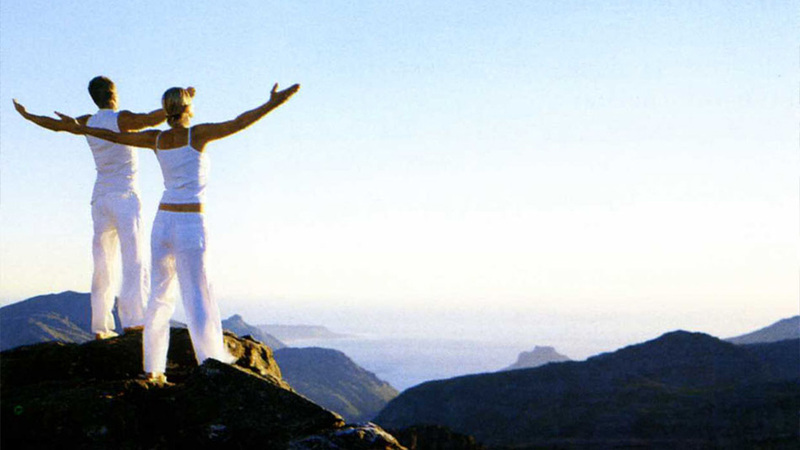 ALARM SYSTEM | The WaterNest 100 alarm technology is your security. Intrusion, gas leakage, power cuts are no more a problem also when away from home: (1) Burglar alarm – Protects all rooms and all accesses. A warning message by telephone, mobile, text-message or e-mail is made to a preset number or mail address. 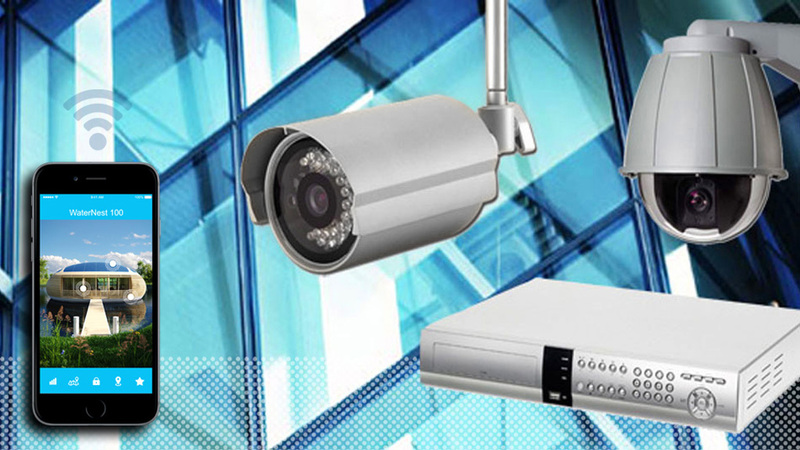 (2) CCTV – Local and remote visual check of all rooms in your home through a closed TV circuit. (3) Technical alarms – Warning in case of water and gas leaks and power cuts, and preset safety actions. (4) Automatic reset / Lifesaving Stop & Go. Automatic circuit breaker reset after overloads or sudden electric discharge due to weather conditions. Each function can be customised, controlled or shared on a smart-phone using the appropriate app.